Philadelphia, PA (January 10, 2019) – The Neat Company, a leader in expense management and bookkeeping automation solutions for small businesses, is pleased to announce that their popular solution is now integrated through the MyQuickCloud platform. The Neat Company has been a value-added solution provider within the QuickBooks® ecosystem for many years. 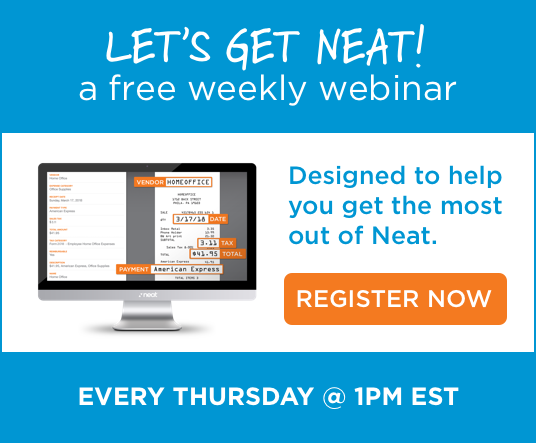 Today, thousands of small businesses throughout North America use Neat to accurately eliminate time-consuming data entry into both QuickBooks’ Online and Desktop versions. Neat is committed to continually enhancing its capabilities its and integration to the QuickBooks platforms. MyQuickCloud provides remote access to the QuickBooks Desktop platform, enabling multiple users to simultaneously share their QuickBooks company file with their employees, clients, accountant, or bookkeeper. Through this seamless integration, MyQuickCloud users can now efficiently capture and manage receipts, bills, invoices, and other business documents. Users can also benefit from accurate data extraction and save time with automated data entry into the hosted version of QuickBooks Desktop. MyQuickCloud users will be able to connect their hosted QuickBooks Desktop instance with Neat, from right within the platform. “MyQuickCloud is excited to be working with Neat to provide our mutual customers with hosting and remote access services. We both share the same values of productivity and mobility and can’t wait to get started”, said MyQuickCloud CEO, Talal Choucair. The Neat Company provides small businesses, accountants, and bookkeepers with a cloud-based expense- and document-management system, which streamlines the collection of important financial documents, automatically extracts key information, provides real-time insights, and eliminates time-consuming data entry into accounting systems. Neat’s patented ID2 technology intuitively classifies documents and populates key data fields, helping small businesses organize and categorize financial information that is critical to their businesses’ needs. In order to manage the high daily volume of expense transactions and financial documents, Neat gives small-business owners the power to capture and access files from any device, taking productivity to the next level. By consolidating reporting and eliminating time-consuming tasks like data entry, Neat streamlines accounting and tax-related workflows, giving time back to small businesses so they can get to what matters most. At MyQuickCloud we believe in connecting people and contributing to a modern way of working. We have created a great and cost-effective Enhanced Remote Access and Desktop Application Sharing technology for everyone because efficient remote software should not be reserved solely for large companies. Our software allows users simultaneous access from anywhere at any time and we pride ourselves on this as well as offering managed cloud hosting to our clients that is secure, fast, and stress free.